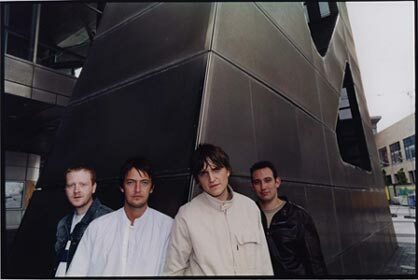 It was back in December 2000 that Designer Magazine first hooked up with Starsailor. It was before the legendary NME Tour and it was the first national interview the band had ever done. Now nearly 3 years later Designer Magazine talks in-depth to drummer Ben Byrne about the bands second album "Silence Is Easy", working with Phil Spector and what it was like to support the Rolling Stones at the recent Twickenham dates. Read on for the only interview you need to read about what is looking likely to be one of the albums of 2003. Q: If we take it back to that very first national interview that you did with us when you supported Angelica at the Manchester Roadhouse. It's been so long since that point do you still remember the early days when you were just stepping out? A: It was all a bit strange at first, just kind of getting your head round the industry. The first year or two is just a bit of a whirlwind really. Were getting a lot more relaxed now and happy with what were doing. I just think we've improved and it's a real learning process really. Doing this 2nd album has taken us 8 months to record it, we just wanted to improve ourselves from "Love Is Here" and I think we've managed to achieve that as well. Q: Yesterday you were supporting the Rolling Stones. Do you still feel the same people after all you've been through and done? A: Yeah, were still the same people. It was a shame because we didn't get to actually meet them with Mick being ill and everything. There was supposed to be a meet and greet in-between our show and when they were going on, but due to everything that had gone on it didn't happen in the end. I didn't manage to have a JD and Coke with Keith which was a shame (laughs). The gig was strange because everyone's going there to watch the Stones aren't they, but we felt that mid way through the set we were turning a few more heads. By the end of it we got a massive stand ovation which was quite endearing really. You don't really know what to expect because being The Stones you tend to get quite a lot of older people going who have probably never heard of us. Believe it or not that was actually the 100th show or something on the tour and they can still rock it. I think i'll be retired by that time mate...on an island in the Caribbean spending my millions. Q: The new single "Silence Is Easy" touches on this. You suffered a mini-backlash after the first album where it seemed very easy for people to knock you guys, Coldplay and Travis. How does that effect you as a person? A: It's always the same, bands always get a little bit of that. You've just to get on with your own job of writing music. You focus on your own thing and don't get caught up with the whole press thing cos you can't aim to please everyone. We've resolved the whole Noel Gallagher situation so it's hard to talk about that now. Apparently Noel had said it was just a fight in the playground or something like that. He'd completely forgot about. It was quite crazy though at the time fighting with the biggest band in Britain and i'd missed the fracas at T In The Park cos I was watching Black Rebel Motorcycle Club so I'm staying out of it. I don't know where we fit in now and obviously were always gonna get lumped in with the Travis / Coldplay sort of sound, but I think each band has got their own sound. Q: The new album does seem much more of a band effort than the debut. If you imagine "Love Is Here" as the bare bones of Starsailor. It seems like you fleshed it out a little and exposed more of yourselves. Did it seem like that recording it? A: We've grown in our abilities and got a lot more confident...and obviously we've used a lot of orchestral string arrangements. After we'd finished touring, the madness of touring for two years, we just settled back into rehearsing in our old rehearsal rooms in Warrington and wrote. "Fidelity", "Music Was Saved" and "Four To The Floor" came together in about a week. On the first record we didn't really have the experience to have it right as a record. Obviously we had Steve Osbourne produce the first record so he could guide it a lot more and get the best out of us. On this one we felt we had a little more control over what we wanted to do and we took it onto another level with this record. Phil Spector produced two tracks on it which were incredible, John Leckie produced one track and we produced the other 8 tracks with a engineer called Danton Supple. Q: The first time I heard the album at one of the playback sessions just over a month ago I didn't hear the songs standing out in the same way "Alcoholic" or "Good Souls" did off the first. But now listening to it here in the office, it does seem to be one of those growers. Is that how you see it? A: We probably worked on it over 8 months so there were a load of different changes going on with the arrangements. James was really into this kind of idea of laying this stuff down with the strings. I think it's a lot more upbeat with this record. "Love Is Here" is very slow and there's lots of ballads whereas this one's a lot more positive...which is what we want cos I'm a rocker at heart. "Music Was Saved" is one of my favourites and the grandeur of "Telling Them" sounds incredible. At the end it sounds almost like a film score. Q: As these guys from the North of England how was it when you got the phone call in about Phil Spector? A: It was like what's he working with us like. When we were in LA his daughter came to watch us at one of the shows and she went and told her dad about it. He just got really excited and we went to meet him at his mansion and he decided he wanted to do a couple of tracks with us. It was a dream come true really innit. If somebody would have said to me 3 years ago you're gonna work with Phil Spector and play with the Rolling Stones I'd have laughed in their face. It was weird because Phil hadn't worked for about 20 years. So when we went in the studio he didn't have a clue how to work it. He could hear what he wanted to get from the track, but actually working the desk Danton had to be really patient. He'd had Danton there till 5 in the morning trying to get mixes right after we'd left a hour or two earlier. It was a great experience working with him though. He just layers tracks upon tracks upon tracks. 2 bass' on "Silence Is Easy" and loads of piano stabs driving it at the back. Q: How was it when the allegations came in about him? A: We were shell-shocked really. I know it's not gone to court yet so I don't know what's happening there. There was a sense that if we'd have said the wrong thing it could have been us. We did the album over here in Abbey Road, but if we'd have done it in America he might have ended up shooting me or Barry. Q: You're heading out on the tour next month. "Silence Is Easy" is quite an epic and also quite a different album to the debut. How's that going to transfer to the live shows? A: It's great now. When we were playing the festivals last year we had to play all the ballads when were playing for an hour and it kind of didn't work. This albums a lot more energetic so we can't wait to get out there and mix it with the old stuff. And we've had Mark from the Charlatans playing a few shows with us, so we've got an extra guitar player to beef it up and it frees up James to concentrate on being a frontman. It's weird though because I always used to go watching bands at the Apollo and now were playing there. And even stranger is that the next logical step after these shows are Arena's this time next year.